A quilters dilemma…overcome by fabric!! Anyone who quilts knows you NEVER have too much fabric!! I might have 700-800 different fabrics on my stash shelves (organized by color) but it is rare that I make even one quilt without thinking I better look for a specific color or design. It truly is an addiction but a harmless one! But the fabrics neatly organized by color on my stash shelves are only part of the fabric management picture. I have TONS OF BINS of fabric!! I am being overcome by bins of fabric!! I have bins of small scraps in my closet on shelves. I have bins of larger pieces and strips on a shelf under my cutting table. I have five larger bins of larger strips of greens and browns specifically for landscape quilts. 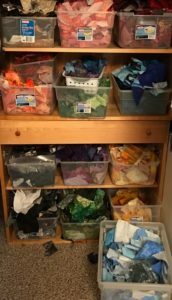 I have several large bins of beiges and blues for ocean and dunes quilts. 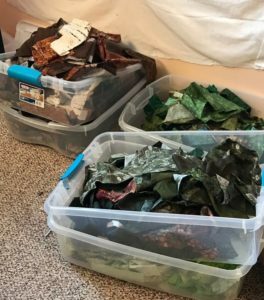 And I have ziplocks full of various size small square pieces of fabric for mosaics, all sorted by color and sometimes shades within colors. It is crazy!!! 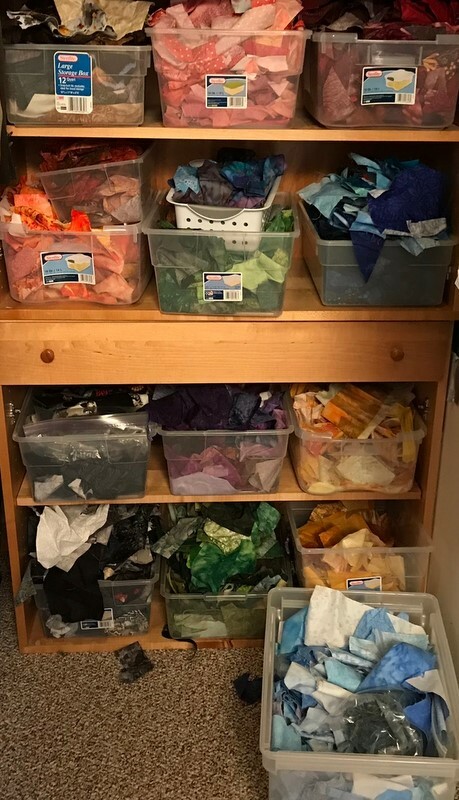 Last week before I let myself start any new quilts I did a sort of most of these bins, pulling out fabric colors and patterns I have not used in a year (to give away) and getting rid of pieces too small to use easily. It was almost a week long effort and took way too much patience when all I really wanted to do was sew. 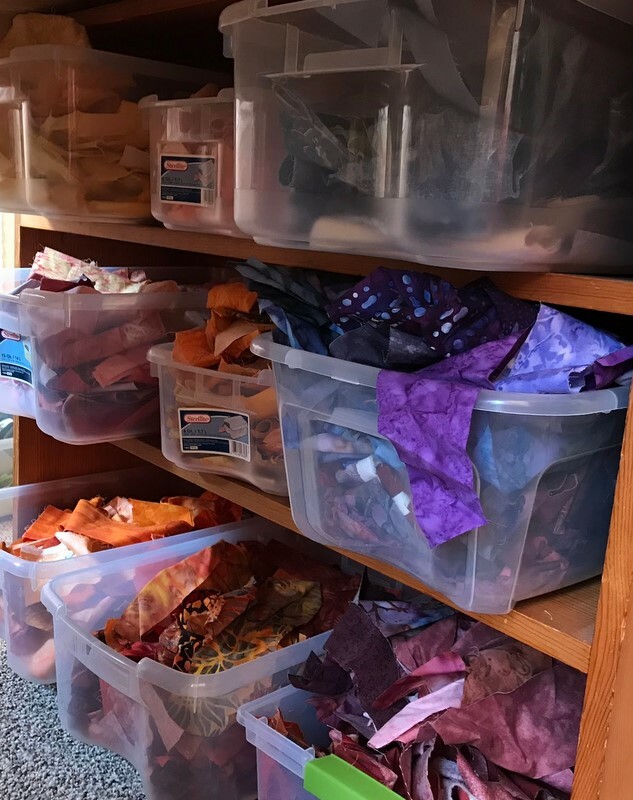 But….I discovered some scraps of old favorites I haven’t been able to replace and I trimmed down by 3 bins which I immediately filled with more precise color sorting. Each bin is less full than before….this is good!! I feel less cluttered now and ready to sew…. I would love one tenth of your stash! 😊 I have been a mosaic artist and have the same kind of “problem” with glass. Thank you for your blog! I’m learning a lot! Thank you for commenting and glad you enjoy it! I’m still learning where to find comments so I apologize for my late follow up. Nice to hear from followers!